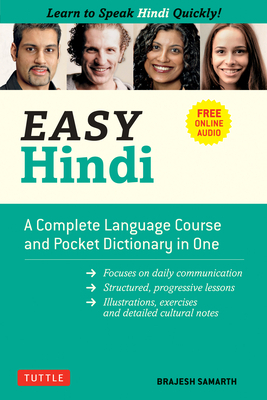 Concise and user-friendly, Easy Hindi: A Complete Language Course and Pocket Dictionary in One is perfect for anyone who wants to learn Hindi--whether on their own or with a teacher. This language learning book is the perfect introduction to Hindi for beginners. It enables users to begin efficiently communicating from the very first day, and its compact size makes it an excellent tool for travelers or business people looking to learn Hindi on the road without giving up on any content. The free online audio provides pronunciation with many hours of native-speaker recordings of the dialogues, vocabulary, and exercises. Brajesh Samarth is a senior lecturer and language coordinator in Hindi-Urdu at Emory College of Arts and Sciences. His research examines the processes of identity maintenance through language in the Indian diaspora. He has extensively studied Hindi-Urdu literature and music including South Asian diaspora poetry, Dastangoi (the lost art of Urdu storytelling), storytelling through Phad painting, Sufism, Yoga, and cultural symbolism related to Rajasthani turbans. He holds a Ph.D. in linguistics, and has taught Hindi and Urdu in various language programs such as the School for International Training in Jaipur, Stanford University, and the University of Wisconsin-Madison.